423. The total production of flovour Z in 1997 and 1998 is what percentage of the total production of flavour X in 1995 and 1996? 426. 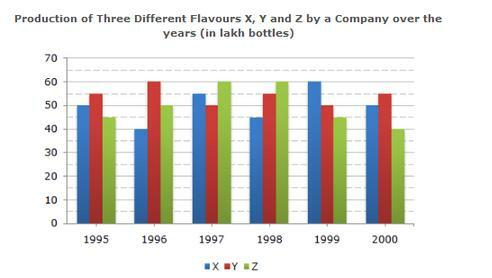 What was the approximate decline in the production of flavour Z in 2000 as compared to the production in 1998? 427. For which of the following years the percentage of rise/fall in production from the previous year is the maximum for the flavour Y?